I grew up in Arizona, attended The University of Arizona, graduated with a Bachelor’s of Science in Dietetics/Chemistry. Played a variety of sports including soccer, volleyball, and lacrosse, all of which sparked a long distance running hobby! I have a Comprehensive Fletcher Pilates Certification: A yearlong 600 hour program that mimics an apprenticeship with written, and physical tests, as well as observation, and student teaching (mat work, floor work, reformer, cadillac, pedi-pull, fletcher towel, magic circle, chair, high barrel, spine corrector, cadillac). I am Certified on the Lagree Fitness Training Method that is used at MegaFit. The Lagree Fitness Method means being efficient, it is as simple as that! 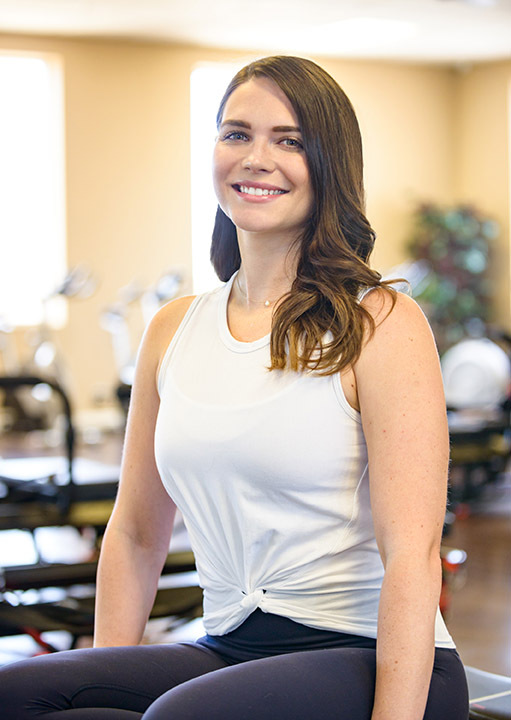 The Lagree Method, and equipment gives people a low impact full body workout in 45 minutes with significant results clients can see and feel with just coming in 3 times per week. The beauty of this method is that it does not have to be complex to be effective or push people out of their comfort zone. I bring a unique outlook to every class to challenge every client in a different way, whether it is a new spin on a basic movement, forcing an extremely slow and grueling pace, or a new movement altogether. I make it my mission to keep myself learning, to be able to provide the best quality techniques for everybody that walks into the studio.